Do you need a fun, personal and thoughtful gift? Our embellished house shoes are perfect for Mother’s Day, Christmas and other gift-giving occasions. Based on inexpensive purchased shoes, these can be made quickly, in less than an evening. We chose slightly retro embellishments and shades of pink and green to add that tacky note we’re so fond of, but you can customize your shoes to suit your taste. 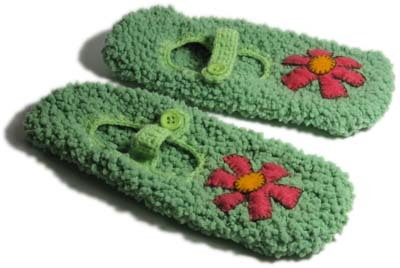 We used knitted green slippers, but any kind you can sew on are fine. Our pattern includes two flower styles, a “wonky” asymmetrical flower with square-edged petals and a standard daisy with rounded petals. We used two colors which would contrast with the shoes, a salmon pink and goldenrod yellow. Using the pattern, cut two flower shapes and two center shapes from the felt. Daub a little glue on the flower centers to hold them to the flower shapes without having to pin. 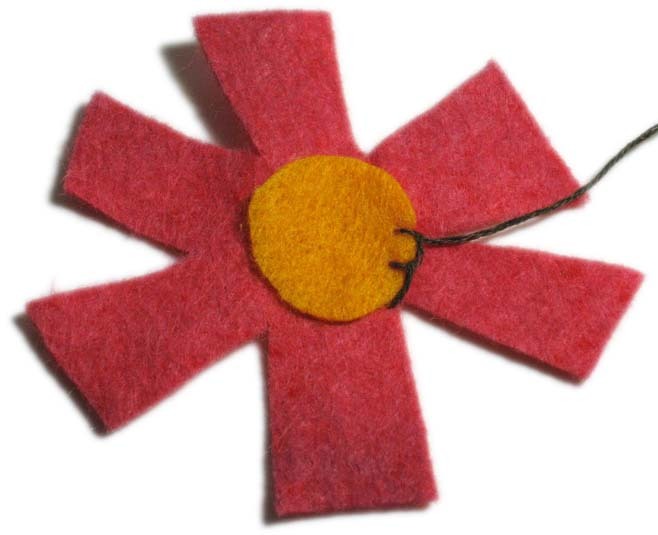 Using three strands of embroidery floss, sew the flower centers to the flowers. We used a blanket stitch, as shown in this and following steps, but you can also using a running stitch or other type of stitch. 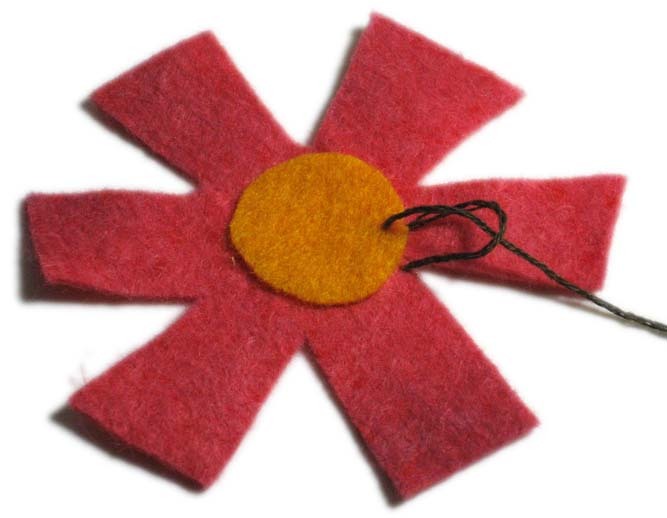 To do a blanket stitch, start by knotting your thread, then bring it up through the flower applique near the edge of the flower center. Next, move the needle a short distance away, bring it down through the flower applique and then up through the center applique. Bring the thread through the loop as shown above. Draw the thread taut, forming one finished blanket stitch. Here’s a second blanket stitch. Was that all about as clear as mud? Don’t worry; there are other sites you can look at which show embroidery stitches. Here’s one which shows how to do a blanket stitch and here’s another which shows how to do several different types of stitches. Now that you’ve sewn the flower center to one flower, place the flower on one shoe. You can use the glue stick to help it temporarily stay on. Using three strands of embroidery floss and your favorite embroidery stitch, sew the flower to the shoe. Repeat all of the steps above for the second shoe. Bask in your newfound shoe-embellishing glory! If you’d like, you can try other variations as well, such as sewing or gluing on ribbons or beads or daubing on fabric paint.